Yves here. We’ve featured Eric Garland’s past posts on Guitar Center, a case study of how a private equity firms (originally Bain Capital, now Ares Capital as a result of a restructuring when the company was on the verge of failure) run businesses into the ground for fun and profit. Garland stresses that the assumptions that Guitar Center and its owners are touting for growth, given the state of big box retails, amount to an advanced case of magical thinking. Garland also focuses on the broader impact of the Bain/Ares misrule, namely the damage done to employees and vendors. It is time for an update on one of America’s most original and exciting retailers, Guitar Center, the operation that epitomizes American business in 2014, with all that this implies. If you’ve never read my work on Guitar Center, click here and get caught up. Don’t take too much time, because something new and insane might be announced. Ready? Because the entire retail sector is in the middle of an historic transition, GC’s enormous debt structure meant the company was in a precarious position that would not be improved from incremental economic growth. They were in serious trouble, and they would run the standard Bain Capital playbook to get out of that trouble, or lose the company entirely. GC would squeeze its vendors to make up for badly-needed cash. They would also treat their employees poorly to make up for badly-needed cash. Since my initial post from November 2013, those three things have come to pass. Due to GC’s highly publicized financial situation, we were forced to evaluate their credit worthiness. As a result of their credit rating, it was determined that they were a high risk and we were forced to put them on business hold. We certainly respect GC’s decision to discontinue business with us and we thank them for our excellent 20 year relationship. “Business hold” is the term most commonly employed for no longer sending people goods until they pay past invoices. Unless Guitar Center would like to provide more detail on the matter, it seems like the “unreasonable business terms” could possibly consist only of “expecting a company to pay its bills.” Reasonableness, as the attorneys will tell you, is a subjective matter. This leaves us with the employees. Last year, after trying to negotiate fruitlessly with Bain management to improve wages and working conditions, workers in three of the company’s top markets – New York, Chicago and Las Vegas, chose to organize their shops under the Retail, Wholesale and Department Store Union. Several employees told me that Bain’s changes to the commission structure resulted in lower wages, and this move would be a way to counteract that. Naturally, it is the last thing a company teetering on the brink of financial calamity really wants. The Retail, Wholesale and Department Store Union has filed unfair labor practice charges with the National Labor Relations Board, alleging that Guitar Center has stalled in bargaining talks and “punished” workers who voted in favor of representation. Last year, RWDSU won elections at three Guitar Center stores, although those workers have yet to reach a collective bargaining contract with the company. On Tuesday, Richard Trumka, the head of the AFL-CIO labor federation, accused Guitar Center ownership of using “shameful” tactics to avoid a contract with the unionized workers. Indebted to the eyebrows, squeezing vendors and employees – I called it in 2013, and the events seem to be unfolding in that direction. The only thing I didn’t anticipate was that the taste for junk bonds was so great that somebody, anybody would be willing to finance this company on such risky terms. Hey, you learn something new every day. This is what an economy run by private equity looks like. Are you having fun? Well, somebody is. Let’s Have a Debt-Fueled Party! Well, it’s an interesting day to be thinking about my old friends from California. They are having a big party in New York City tonight to celebrate their new path to glory. They just signed a 15-year lease in Manhattan for a a 30,000 square foot space that will cost a reported $2.3 million per year, and everybody is invited to come down and check it out. 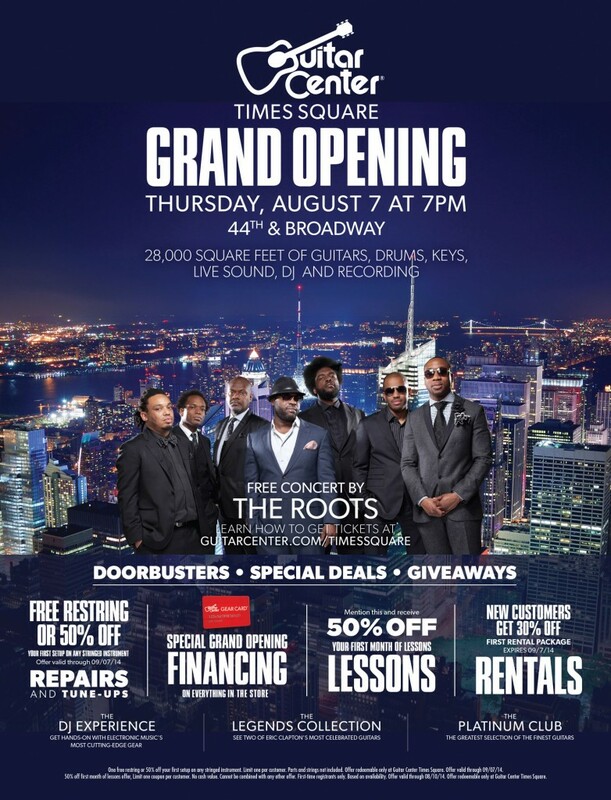 The Roots are playing there tonight, so that’s cool. Hell, I’d go if I were in NYC – it sounds fun. Don’t think the party ends in Manhattan, though, because this is a coast-to-coast strategy! Guitar Center is swinging for the fences and says they plan on opening 15-20 new stores a year until they reach $3 billion in revenue per year by 2020! Now, they already have $2.1 billion of a total musical instrument industry that is $7 billion in its entirety. They want to grow by nearly 50% in five years – 10% a year growth! Now those are numbers that private equity guys can get behind! Damn, 10% growth per year and twenty new stores a year. That sounds like they will be selling a ton of new guitar amps and drumsets, right? Hmm. I’m reading this story and can’t find the word “guitar” anywhere. I saw “XBox” and “DirecTV,” but not “effect pedal” or “bass drum.” Maybe I’m losing my touch at research. I’ll read onward in their plan. The retailer, which has marketing partnerships with QuestLove as part of the new campaign launched this year, has also featured Metallica axe-man James Hetfield, and now electronic musician Steve Aoki, who will be in the next ad, which debuts soon. Hinz said after that, singer/songwriter Colbie Caillat will be featured. Secondary and tertiary markets means “small towns that normally couldn’t support a big box chain.” I’m racking my brain trying to think of how anybody would suggest a growth strategy in a retail environment like the one we have today. Announcing a strategy of straight up, 2005-style retail growth is fascinating when you compare it to the larger trends at play. First, let me show you one chart that will explain why U.S. retail is going to shrink by necessity. 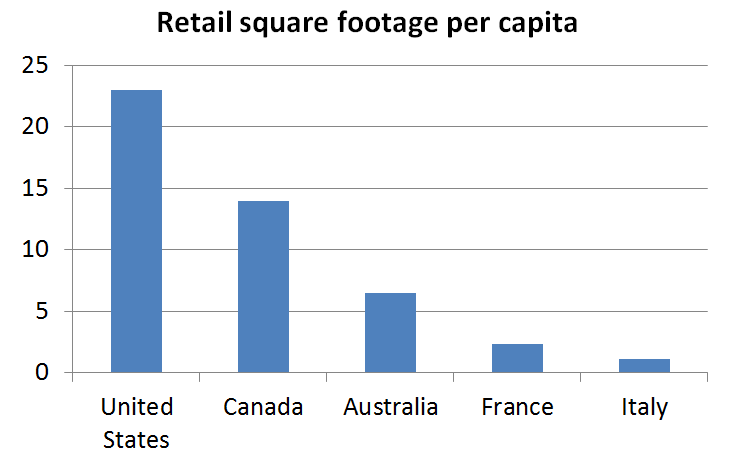 The United States has around 23 square feet of physical retail space per person, the most by far of any nation. And that’s per capita, not total, so it doesn’t matter that “Nebraska is big.” We have ten times the retail space available in France, a country with similar GDP per capita prosperity – the one that invented the department store. We have seven times Sweden’s retail space, ten times England’s and twenty times Italy’s. All those stores cost big money to operate for households that are about as rich as their counterparts in other industrialized nations. And guess what – we’re shutting down that space, not growing it. Radio Shack is closing 1,100 stores. Staples is closing 225 stores. So are Barnes & Noble, Best Buy, JC Penney and others. It’s not 2006. We don’t have the Fake Wealth from Our Fake Housing Prices lines of credit fueling these big box operations, which were made possible by the historically-unique intersection of cheap Chinese manufacturing and reckless banking regulation. And what of consumers and their jobs? There are 12 million Americans who dropped out of the job market, no matter what you hear about unemployment being at pre-crash levels. All those people not working – are they shopping? 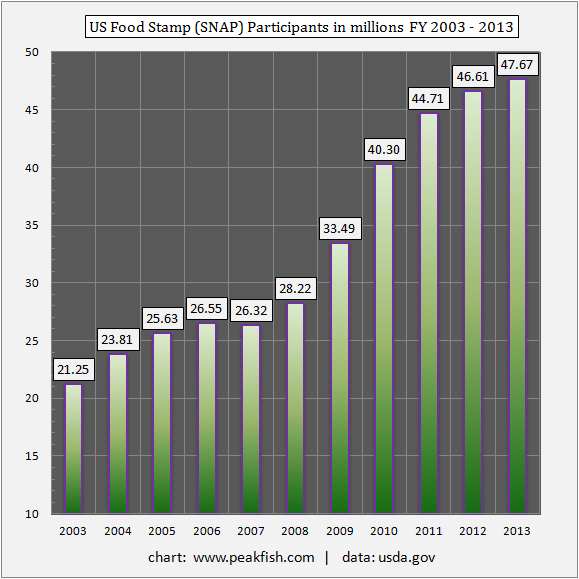 Here’s another chart of many – the trend line of those receiving Food Stamps in America from 2003 – 2013. This is the environment in which we are supposed to envision 10% of growth of people spending money in shops. I mean, if Warren Buffett gets into guitar, this could all be moot, but for the moment, big box retail is a Middle Class play. The only way you can justify large amounts of debt is the notion that it will be used to fuel growth. Otherwise, all that debt and complexity are nothing but a parasite on your operations, on the whole economy. That’s a pretty easy story to pass off to Americans, lucky for Guitar Center – we’ve had centuries of growth, and we’re accustomed to its constant, reassuring presence. But reality does not require public relations – it merely asserts itself in our lives. Maybe Guitar Center will find an extra billion dollars of revenue from this small industry in just five years. I’m sure it looks good in the investor prospectus for some fund manager dying for something that will cough up 10% growth. I’m just not convinced how it will look for the workers, vendors and musicians. This entry was posted in Dubious statistics, Economic fundamentals, Guest Post, Private equity on August 11, 2014 by Yves Smith. I think in these good times bad times they’re just dazed and confused and this leads to communication breakdown with reality, resulting in them being trampled underfoot. i’m crunging at your attempt at humour. How Many More Times will GC believes they’re Houses of the Holy but actually just a financial Heartbreaker? They’re on the Night Flight over The Ocean to Kashmir. Ironic how they’re having a Celebration Day while the employees have few Good Times Bad Times. Just a hunch but I suspect what has been keeping GC from completely imploding is baby boomer nostalgia for the Woodstock/70’s or 80’s hair metal bands. I know some weekend warriors with guitar collections that would have made Jimi Hendrix jealous. don’t see many kids picking up the guitar and learning the instrument these days. More likely they’re playing the latest video game or texting. Once those boomers finally start heading to the great gig in the sky, it’s time is up. Ha ha! You’re absolutely spot on with this comment. I’m 32 now, and when I was 16, bands were starting to get big again, but all of that has gone downhill since 2006. I don’t know one young ‘un who wants to start a rock band. Who needs bands when you have Ableton Live? Mainstream music is hip-hop, so not so much guitar (there’s still country though). Neither does electronic music (especially Electronic Dance Music). Not sure where aspiring musicians get their mixers and keyboards – in any case, the main instrument is a laptop though, probably a Mac. That works out to $6300 per day. How many guitars and picks have to be sold to make that nut? To Guitar Center CFO Tim Martin, this is innovation. To skeptics it’s crazy. Aren’t innovators a bit crazy? The real heartwarming part is that Bain lost half a billion dollars. Good for them. Now if they would kindly lose all their money and slink off into a hole to die, that would be perfect. I worked in that building in Times Square they just moved into. The crazy conventional wisdom about Times Square property is that you don’t have to cover your rent from sales- it’s instead seen as some kind of Marketing Expense. You think the M&Ms store sells enough chocolate pellets to cover the nut there? Forget it. It’s ‘brand exposure’ for the millions gawping tourists that shuffle through there each year, apparently. And when you can decouple rent from even store earnings on the ground, you can charge whatever you want, right? The Times Square store is definitely a prestige store and not expected to make money. I don’t see how Guitar Center, as a company, will make any money. I just ordered a nice Ovation Balladeer on Amazon, as well as all needed accessories. All my friends buy from Amazon or support local music shops. I have not set foot in a Guitar Center since 2006, although I want to visit this Guitar Center in Time Square just for chuckles. To put this in perspective, in mid-June junk bond yields fell under 5 percent. In each of the last three US recessions, junk bond yields pushed into the teens. Deformations such as the debt-leveraged PE industry provide a vivid example of how ZIRP destroys an economy from within, by systematically distorting lending and borrowing rates. Thank you Mr Yellen. I saw an ad about Slash playing at a Guitar Center store in an out of the way place and was puzzled by it but figured, hey, maybe he’s on tour in the area. Anyone going to ask the talent agents if their clients are getting paid? Because these kinds of performances don’t come cheap. The crapification of formerly productive, quality/satisfaction-oriented industries by the shock doctrine extractive methodology of private equity pirates is deeply infuriating to me. It is the undoing of America, enabled by policy choices; and it doesn’t have to be this way. We chose it, hell, we almost elected it’s marquee practitioner as President. Appliances, power tools, furniture, snack cakes, guitars… you name it, the PE people are ruining it. They really DO NOT CARE what it is they are selling, or used to sell, that thing is merely the goose to be strangled. They buy the goose with someone else’s money, then roast the goose in the back room, and then trot out a bunch of gaudy plastic chickens to foist off on the buying public instead, until they eventually get wise to the switch, while the whole hollow facade implodes in a pile of phony ponzi accounting. The PE firms get their fees while they cannibalize the company – enabled by tax preferences – and they leave behind a crater where a productive, employment-creating, tax-paying, product-generating piece of the economy used to be. Tearing our economic foundation down one brick at a time. It is the desertification of our economy. Parasite is the precisely correct word. Vampire squids, Descending on vibrant living entities, inserting their blood funnels, and sucking the host dry. Then moving on down the line to the next host. A disease-spreading host-killing parasite that we as a nation have been unwilling to swat. Yves, Guitar center moved out of its Best Buy corner location and into a shopping center closer to downtown Lansing. A shopping center with a locally owned music store covering 6k-8k square feet of retail space. Now being a guitar player, I vaguely know about the pros and cons of the stores. A physical store is great because you get to play with the equipment right there in the store, a real hands on experience. Also, the local physical store will have vintage equipment, whereas online will only have the latest models. But a Guitar Center store also will not carry vintage equipment too often. They tend to stick with the latest and greatest. If they did happen to have a customer come in and trade in his 1930s Martin ($100k guitar), it is quickly hidden in the back rooms and then shipped elsewhere; they are rarely put out on the floor for sale.The store is also great for when you need a set of guitar strings or a cable. But if I want anything else, I will order online. Musician’s friend, one of a series of online only gear companies, will ship to your house free of charge, they will allow you to play the equipment for up to 30 days and then return it without complaints, and they will sometimes pay your shipping. And their pricing is most always better. You are not aware that Guitar Center purchased Musicians Friend a few years ago? As a working musician with my own (DIY) recording studio, I’ve spent 10x more music-related money at Radio Shack than Guitar Center. Obliterating Guitar Center wouldn’t affect me one bit – recording or playing – but the Radio Shack closings have already made the cables, switches, plugs, adapters, etc. a little harder to find. The bit about Behringer is telling. As a long time musician, my fear is that when Guitar Center eventually collapses, it will take down some venerable American manufactures with it. Companies like Gibson and Fender are extremely dependent on GC and may not survive if the chain fails. Not only is GC leveraged way out, from what I’ve heard, so is Gibson — one music store owner told me that Gibson owes Saga (the Korean company that manufactures Gibson’s entry level instruments,which is their bread-and-butter) many millions of dollars. 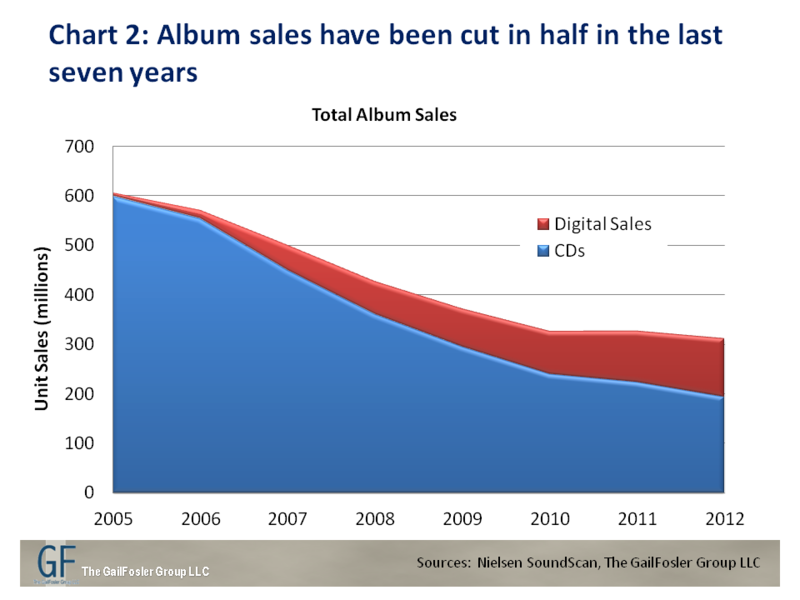 Or maybe guitar center’s demise will create an opportunity for the other music stores around the country. Raise profit margins a little, and allow for some growth in the mom and pop stores. In any case, its hard to feel any sympathy for Guitar Center. But let’s hope they don’t pull down the manufacturers with them! Fender announced yesterday that they are going to compete against their own retail distributors. Translation: go try it out in a GC, but buy a new one direct from Fender online. Just in case GC tanks, they’ve covered their backs. Check out the article in Music Merchant Retailer. I used to play guitar several years ago, going to Guitar Center (Chicago) was a nightmare of pushy salespeople. They were either working on commission or had been beaten to death w/ metrics. However, they are probably the only shop still open after 6p, and if you’re a musician with a gig tonight or tomorrow night, and you need something specific, they are the place to go to. Thanks for this Spot On article. If you wish to know documented data on Bain Cap. Etc., busting out public n private companies – please advise. Wonder if GC was a subject of conversation in meetings between Private Equity lobbyists and the Fed and OCC reported today by Reuters? It is of interest that these meetings are occurring now, as I believe PE firms have historically fallen outside the regulatory agencies’ direct purview. Maybe the large PE firms are being deemed “SIFIs”? Although based on this article the “Why?” for the meetings is fairly self evident, the “Why Now?” would be interesting to know.